The timeline of the burger implies that it would be totally unprofitable as a menu item, except that when McDonalds reintroduces it after removing it from the menu (on grounds of being unprofitable), people get very excited. Which presumably helps with the profits. 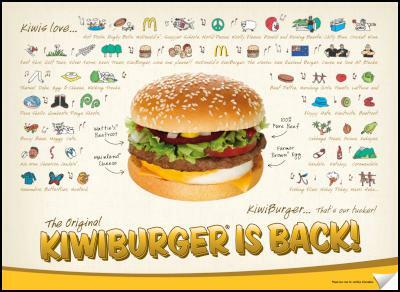 The burger comes with a song with many Kiwiana terms (Kiwiana itself being a new term to me) that are illustrated on the picture above. The image is from an article on the 2007 reintroduction of the menu item. It not only places beets on a burger but also shows that in New Zealand the term is beetroot and that beetroots have recognizable brand names in NZ – in this case Watties. The KiwiBurger is a beef patty with egg, beetroot, cheese, onions, tomato, lettuce, ketchup and mustard. If you get the Gourmet Burger version it is beef patty, beetroot, egg, pineapple, cheese, salad, mayonnaise and relish. Because I’m a liberal Vermont foodie, when I made it for dinner the other night I did not simply imitate McDonalds but did a compromise position between the McDonalds and not-McDonald’s version. I rebelliously swapped in the mayo from the Gourmet Burger version for the ketchup & mustard from the McD’s version. It seemed like that would taste better, too. It did taste good. I believe that New Zealand contains the most slang food terms per capita of any place on earth. If the lyrics to the McDonald’s song didn’t suggest that might be the case, check out this introduction to New Zealand food, posted on The Kitchen’s Garden. Anzac Biscuits – Yes, they are cookies but they aren’t super sweet cookies and there are so many NZ dessert options to choose from you need to spread them out across the course of the dinner. So we start with Anzac Biscuits. Smoked Fishcakes also with the kiwifruit salsa, and sour cream – these are pretending to be Whitebait Fritters. I used a fish smoking recipe from an old Chinese cookbook I have. Place a very large skillet on a burner. Line the skillet with foil, cover the foil with brown sugar and some ginger root, place the fish on a foil-wrapped plate held a little above the bottom (by a rack or if you’re me by an aluminum pie pan folded up), seal the tent, and burn the sugar inside for about 15 minutes per pound of fish. Turn off the burner and let smoke subside before opening the foil. Then I mashed potatoes equal to the volume of fish, salt and peppered them, mixed them with the fish (shredded) and one lightly beaten egg per pound of fish, and made them into fish cakes to either pan fry or bake in a 400 degree oven depending on your patience levels. Kiwi Burgers – See above. I used the Molly Steven’s roasting method (as related here) to produce a lot of small burgers at once. I also am a roll snob and used the Parker House roll recipe from Cook’s Country Cookbook for the rolls. Baked Sweet Potatoes with Almond Sauce – I did not use the almond sauce that’s in this blog, but I think it would have been better than what I did make so I’m linking it. The point was the sweet potatoes because the Internet tells me that’s a common NZ vegetable. Beetroot & Aubergine Pilau – this is authentic because they specify beetroot and say aubergine instead of eggplant and the recipe is on a New Zealand foodie website. Normally one would go with Pavlova in an Australia / New Zealand regional dessert situation. I chose Ginger Crunch bar cookies and Hokey Pokey Ice Cream. 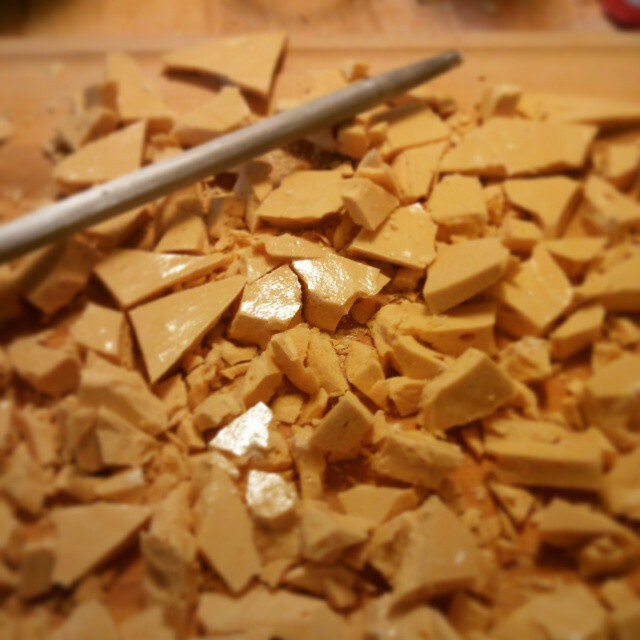 I made the ice cream by combining bits of Honeycomb candy (aka Hokey Pokey) with this simple ice cream base from David Lebovitz* minus the vanilla. The candy will eventually begin to dissolve into the ice cream base, so don’t let it sit around the freezer too long. Because we were cooking for a crowd and do not own a commercial deep fryer, I did not go for the traditional Fish & Chups (aka chips, aka French fries). That being said, homemade fish & chips are delightful. Also, if you are in a place where cooking with fire pits seems feasible, I highly recommend the book Cooking with Fire by Paula Marcoux. And do I need to say New Zealand wine to go with the dinner menu? New Zealand wine. Breaking Up Honeycomb: This has smaller bubbles than you’re “supposed” to have for this candy, because you want it to still have the foamed texture when you make it into large crumbs for the ice cream. Just give it an extra stir around when you add baking soda. 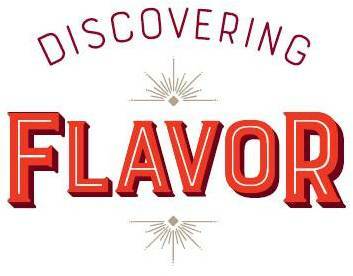 *If you want to get dorky about different bases for flavored ice creams and this particular “Philadelphia style” approach, I recommend this New York Times article by Melissa Clark. And you know what? It’s just about summer so if you were ever to get ice cream dorky, now is the time.